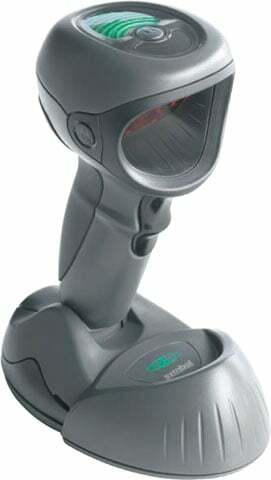 Motorola DS9808-R - SCANNER ONLY, 2D Imager, Standard Range, Driver's License Parsing, Integrated RFID. Cable and power supply sold separately. The Motorola DS9808-R is a ground-breaking data capture device that represents two Motorola firsts. The DS9808-R is not only the first combination 1D/2D barcode scanner and RFID reader, it also represents a new RFID product category - the first combination handheld/hands-free UHF RFID reader. Motorola's revolutionary imaging engine enables the capture of 1D and 2D barcodes as well as images and signatures, with record swipe speeds on both 1D and 2D barcodes. The DS9808-R also offers a new standard for barcode scanner reliability, providing the maximum uptime required in the demanding retail environment. The 4 ft./1.2 m drop to concrete drop specification ensures dependable performance in spite of the inevitable everyday drops and bumps. Cable, USB, Power Plus Connector, 7 feet (2m), Straight, 12V Power Plus (Powered From Host), For DS9808 With RFID, Requires Power supply (Part# PWRS-14000-148R) and US AC Line Cord (Part# 23844-00-00R). The Motorola DS9808-DL00007C1WR is also known as SYM-DS9808DL0007C1WR	or DS9808DL00007C1WR	.